Liberals often claim that only the rich are getting richer--that is, that wealth increasingly is concentrated among the top 1 percent of earners. This is wrong, for several reasons: it presumes income is a zero-sum game, it ignores data on consumption, it compares "bounded" with "unbounded" brackets, it confuses persons with statistical categories and -- relatedly -- ignores income mobility. In other words, being a millionaire is transitory. (Plus there's fewer millionaires than there used to be.) So, it's not like the super-rich are a static strata forever feasting off the poor. 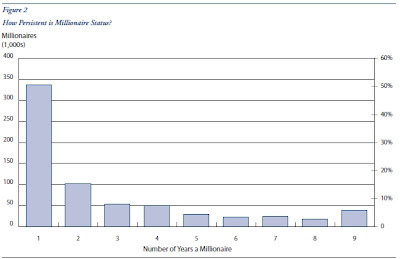 Rather, the top 1 percent (or 10 percent) are not the same people year-to-year. In America, neither poor nor rich is permanent. What happens to the income of the category over time is not the same as what happens to the people who were in that category at any given point in time. But many among the intelligentsia are ready to seize upon any numbers that seem to fit their vision. Most of the people who are called "the rich" more accurately could be called middle aged or elderly. They are not a class. They are an age bracket. When they were younger, they usually were in a lower-income bracket.